I hadn't been to the cinema in so long due to exams and no free time whatsoever and it really sucked. I went to see Jurassic World last week end and I was so excited about it. It could've been excitement that I hadn't gone in so long or that I was genuinely really excited to see this film. I have no idea why but I really love the Jurassic park films, despite the fact that dinosaurs were harming people I find the films so good. The film is about 'Jurassic World' itself which is basically a dinosaur theme park. The park is on Isla Nublar which is where the first film is based. The park brings people in to see dinosaurs like you would at the zoo. To keep people's interest, the park owners invest in genetically modified dinosaurs. They create a mega dinosaur named Indominus Rex which escapes and evokes havoc onto the island. There's not much plot wise you could do with a dinosaur film so it's exactly what you would expect it's going to be. The film is suspense filled which is pretty great, even though you can guess what's going to happen. 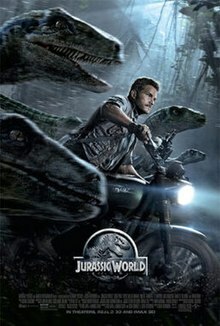 There's parts of the film where I was doubting how realistic things happening in it were, like in the advertisement above with the velociraptors, then you realize it's a dinosaur film and it's not realistic anyway. The film is so predicable in itself but the characters are pretty great. There's strong relations between the characters and family bonding throughout. It's in some parts gory but not too much, the graphics haven't really changed since the original but I don't think there's anything wrong with that. The cast is pretty great too, I can't imagine how hard it is to act pretending dinosaurs are around you when there's really nothing there, pretty amazing. Chris Pratt who plays Owen Grady, the main character and vilociraptor trainer is slowly becoming one of my favourite actors. He is really the main life of the film, I think. The film brings up huge questions about messing with nature and the way humans and animals behave which is interesting to think about. Overall I'd really recommend this film to anyone except maybe children since I did see one little girl crying in the cinema, but you'd kind of expect it, if I was four I'd probably cry too. On the last note, the music in this film is wonderful. The Jurassic Park theme song almost makes me cry every time and it's not even sad. I'd definitely recommend this to anyone looking for a thriller/suspense film. Has anyone else seen it and think it's pretty amazing too?